I am looking for ideas to glue a material to the back sole to extend its life. I already have the glue. Visit a thrift store and buy a cheap used shoe. 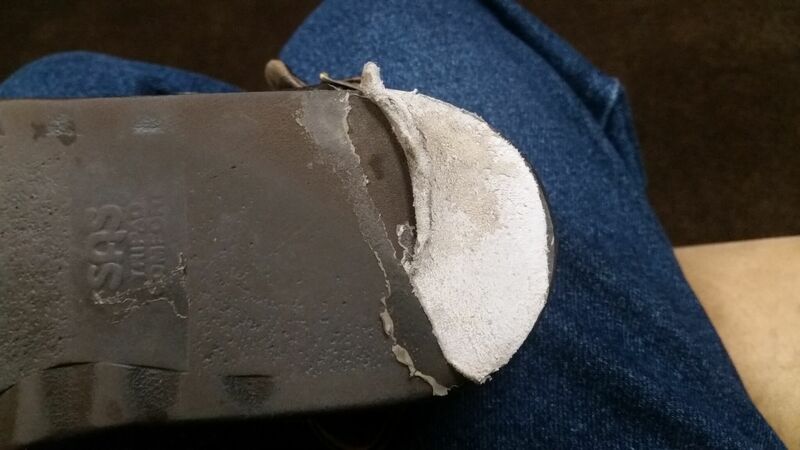 Cut what you need from another shoe with a sharp kitchen knife and the shoe held in a vice. Rubber would be better. Leather will not last very long. You can buy heels and soles online (Topy) For example, link to eBay search for Topy heels. Other options might be the tough rubber they use for car mats, or the rubber they add to the rear of the car. You could visit a wrecker and pick one up for very little. We have specialty rubber stores here: you can buy tough rubber in a strip, in various widths, off the roll. Link to the page showing rubber sheeting on the Rubber Clarke website. Stefan is a new contributor to this site. Take care in asking for clarification, commenting, and answering. Check out our Code of Conduct. An epoxy putty. I have tried a glue gun but it needed to super glued on as the patch fell off. One advantage of the glue gun was it wears down to match your gate/walk and that's good as it goes through a comfortable period and then adding more hot glue is easy as it bonds very well to warn layer of old glue. Hellonearthis is a new contributor to this site. Take care in asking for clarification, commenting, and answering. Check out our Code of Conduct. In my experience mending soles yourself can only be a temporary solution. After a few days or weeks it drops off again. Take your shoes to a cobbler and have them resoled professionally. It's cheap and effective. Meanwhile, think about how you walk and try to put your feet on the ground more evenly. Maybe you can film your feet while you walk and see room for improvement? Try not to drag your shoes on the ground. Not the answer you're looking for? Browse other questions tagged shoes or ask your own question. Is there any way to fill in a hole in my shoe - so it is waterproof? How to protect the lace holes of a shoe from the lace without an eyelet? How to fix shoes worn out inside? New trainers - leaky sole! How to measure shoe size (of Dr. Martens boots)? How can I polish shoes without getting shoe polish on my hands?